General > JUST A BOX OF HEMINGRAY No. 9 INSULATORS? JUST A BOX OF HEMINGRAY No. 9 INSULATORS? Recent discussion and picture postings on ICON led me to dig out something that may interest you. 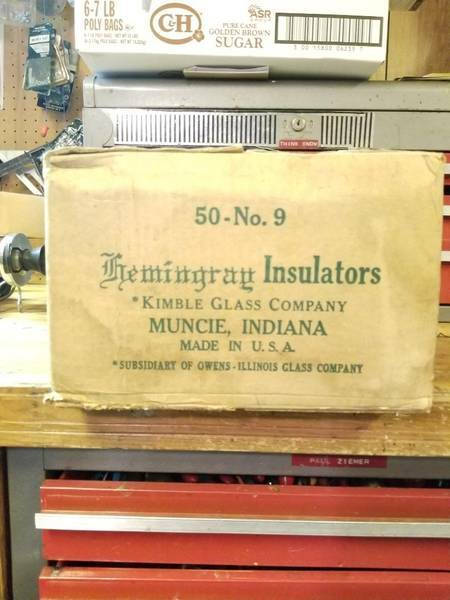 Pictured here is a complete unopened box of Hemingray No.9 insulators. I received this box from a friend many years ago who knew that I collected insulators. Where he got the box from, I do not recall. Shame on me. When he dropped the box off to me, he asked if I was going to open it up. I said no without hesitation. I told him the magic of not knowing what's inside is more interesting to me than really knowing what really is inside that box. All these years later, I still can say No. So, my question to ICON today is, if this box were yours, would you open it up and see what jewels may be hiding inside? Or, would you leave it sealed as is, and let your mind wander painting pictures of what could possibly be inside?